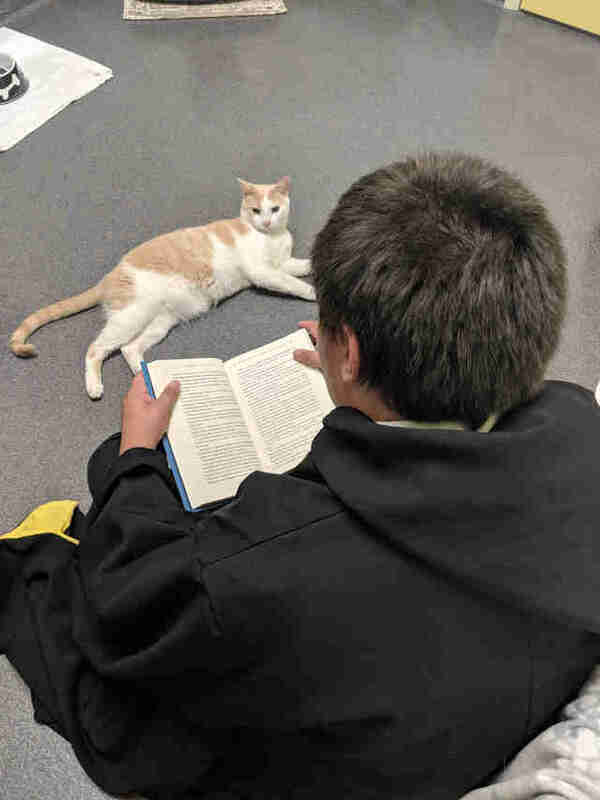 The “Harry Potter” novels have made a lot of lives a bit more magical — and that includes one special cat from Virginia named Stevie Wonder. Stevie, who is blind, arrived at the Richmond SPCA from a busy city shelter in March. 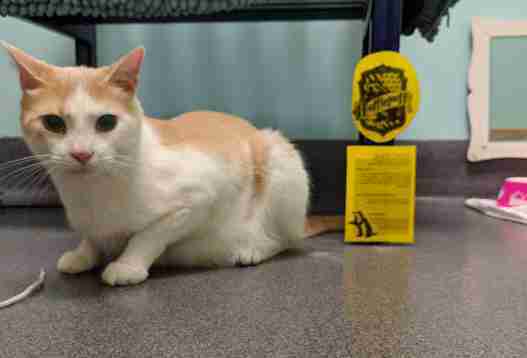 He was originally found wandering the streets all alone — so the new environment was really overwhelming for him. He hid almost all day and would rarely eat. Things got a bit better when the shelter decided to transfer 5-year-old Stevie to a group living area to live alongside other cats. He was still easily startled when it came to people — but in May, he met someone who would go the extra mile to help him: Price McIntyre, a 19-year-old shelter volunteer. 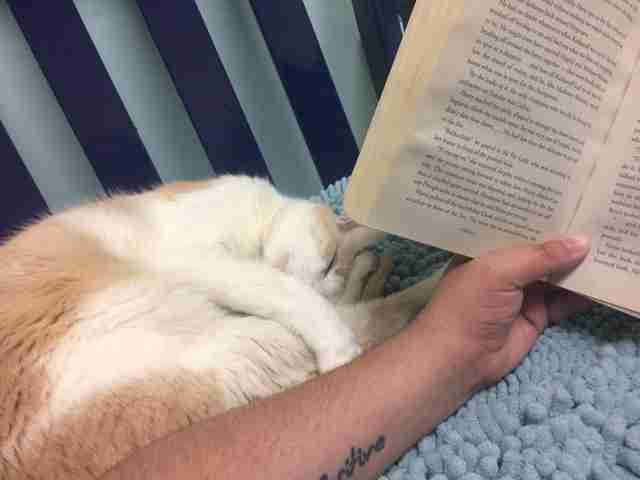 McIntyre took a particular liking to Stevie, and drummed up a mission to help the cat become more comfortable around people: He would start reading to him. 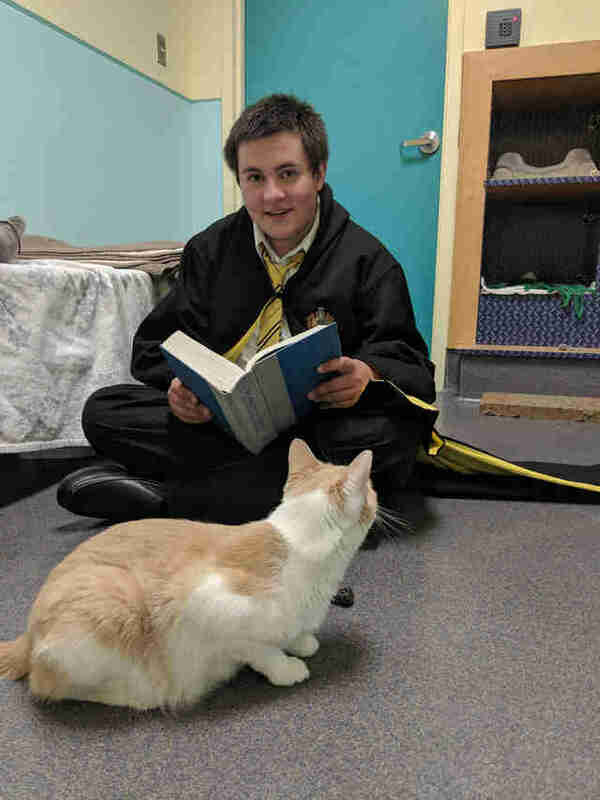 “The SPCA has little Hogwarts decorations everywhere and I thought, "OK, if I were to pick a series to read him, it'd be ‘Harry Potter,’” McIntyre told The Dodo. After all, Stevie had already been “sorted” into a Hogwarts House of his own: Hufflepuff. An employee had started the initiative of sorting cats into houses to give potential adopters a fun way to learn more about the personalities of each animal. Hufflepuffs are associated with loyalty and patience — and luckily, McIntyre had plenty of both for Stevie. Each day, McIntyre returned to see Stevie and simply read to him for a few hours each time. Stevie held onto every word — and clearly began enjoying the company. After a couple weeks, he would snuggle right up to McIntyre to listen closely to the story. Now, McIntyre visits almost every day like clockwork for his special reading date with Stevie. 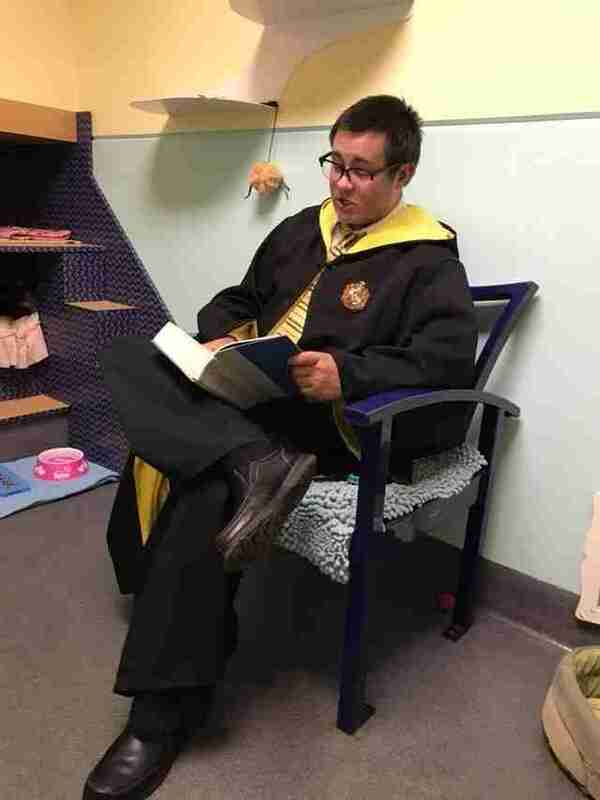 And on Fridays, he comes dressed to the nines in full Hufflepuff robes. Stevie is not only comfortable around McIntyre now, but has also started warming up to other people, too. By now, Stevie has also gained enough confidence to fully explore the cat room — and he’s so confident about it that some people might not even realize at first that he’s blind. Since he’s become so close with Stevie, McIntyre is hoping to be able to adopt him in the near future. “As soon as I get the green light from my mother, I’m marching there and adopting him,” McIntyre said. Until then, the pair will continue to make their way through the “Harry Potter” series — learning together just how far a bit of bravery and friendship can take them. 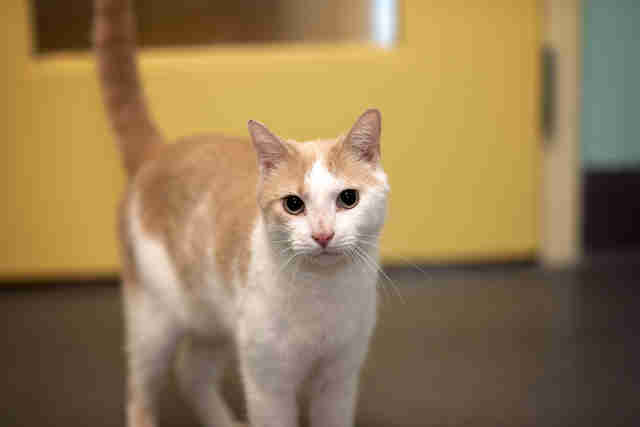 To help more pets like Stevie Wonder, you can make a donation to Richmond SPCA. You can also follow the pair’s literary adventures on Instagram.